Fake globalist-funded court using fake evidence from fake globalist-funded NGOs. In the year 2011, once Russia's President Medvedev, according to the Australian, has "endorsed calls for Colonel Gaddafi to leave office and offered to help to negotiate his exit. " It is a move that has "surprised and delighted" both London and Washington after Russia's initial protest against the extralegal military action that was executed upon an Iraq War-style pack of lies. The "arrest warrant" issued by the ICC is based on evidence acquired from "30 missions to 11 States, and through interviews with a large number of persons, including key insiders and eyewitnesses." The ICC itself notes that the "unprecedented cooperation" it has received has come from "States and organizations, none of which are currently working in Libya." Undeterred by their admittedly tenuous investigation, they go on to provide an enumerated list of their "evidence." like the ICC to further perpetuate their illegitimate, criminal agenda. as it is illegitimate in any sense of natural legality. A look over this "evidence" presented by the "Office of the Prosecutor" reveals an amateurish, almost desperate attempt aimed at the Libyan leader. The entire basis of the "Prosecutor's" case is built upon reports taken from BBC, AlJazeera, the London Guardian, New York Times, the US State Department's Broadcasting Board of Governors-run Voice of America, the globalist-funded Human Rights Rights Watch, and the National Endowment for Democracy and Tides Foundation-funded International Federation for Human Rights (FIDH), among many, many others. 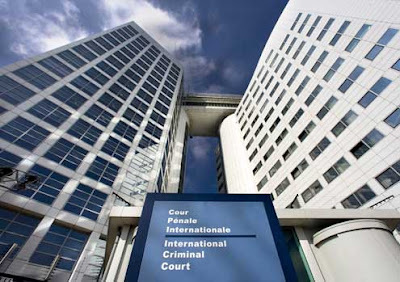 Perhaps depending entirely on their self-appointed authority, slick logo, tall headquarters, and official looking website, the ICC hopes no one actually looks at the "evidence" or realizes that the same corporate-financier interests are the driving forces behind both the fake ICC and the fake NGOs and corporate-funded media organizations that have supplied it with "evidence." It should be noted that even the BBC, along with AlJazeera and many other corporate-funded media organizations have conceded, albeit buried deeply within their reports on both Libya and Syria, that their sources cannot be verified as it is based on 2nd hand information conveyed via "activist groups." It should also be noted that the "Arab Spring's" opposition and these "activist groups" are also globalist-funded. The International Criminal Court itself claims to be, "an independent, permanent court that investigates and prosecutes persons accused of the most serious crimes of international concern, namely genocide, crimes against humanity and war crimes." A visit to the Coalition for the International Criminal Court (CICC) site reveals just who is behind the ICC, who is actively promoting it and networking with the ICC's various NGO partners, and the fact that all involved boast the same financial and political supporters. The CICC claims to include, "2,500 civil society organizations in 150 different countries working in partnership to strengthen international cooperation with the ICC; ensure that the Court is fair, effective and independent; make justice both visible and universal; and advance stronger national laws that deliver justice to victims of war crimes, crimes against humanity and genocide." The CICC however, also is "deeply appreciative of the generous support" provided by the European Union, the Ford Foundation, the Fortune 500-lined John D. and Catherine T. MacArthur Foundation, George Soros' Open Society Institute, and Humanity United. Humanity United in turn boast partnerships with the globalist co-conspirators of BBC World Service Trust, NED/Open Society/US State Department-funded Benetech, George Soros' Open Society Institute, and the NED-funded Solidarity Center which mobilized Egypt's labor unions just as the US-stoked unrest began to falter. These "generous supporters" are literally the same organizations that have built up the very "civil society organizations" the CICC is "working in partnership" with. In other words, fake globalist-funded civil society organizations form a fake globalist-funded coalition, which in turn are supplying a fake globalist-funded court with evidence to further what is entirely a self-serving, politically motivated agenda using "humanity" as a mere and increasingly flimsy pretense. It is an entire network contrived out of thin air with fiat currency, and lent legitimacy by the myriad of corporate-financier owned media operations, such as BBC, AlJazeera, CNN, Fox News, VOA, and the myriad of other "sources" cited by the ICC's "Prosecutor's Office" in regards to Libya. Indeed, the "International Criminal Court" is entirely fake, created by perhaps the most egregious criminals ever to have walked the earth, not to ensure "justice" in any sense we are familiar with, but to augment the self-proclaimed authority and legitimacy the global elite insist we are all beholden to. We are not beholden to it, not by any stretch of the imagination, nor are we beholden to any other contrivance operating in the name of "international arbiter." We have our local, state/provincial governments, within the nation-state. What appears beyond the nation-state are self-serving, multi-national corporate-financier conglomerations that transcend boarders, usurp national sovereignty and authority, and betray any sense of our innate, inalienable individual sovereignty by insisting their "international institutions" supersede all that falls beneath them. Sovereignty and indeed the future of free humanity depends on our individual reassertion of our rights and responsibilities to sustain ourselves, our communities, our states/provinces, and our nation-states. We cannot depend on the Russians or the Chinese to act as the counterbalance to the global-elite because the Russians and the Chinese, through their participation in the IMF, the United Nations, and even the International Criminal Court - all entirely contrived by the global elite - for whatever reason, have fallen directly into a "strategy of tension." Russia's latest flip-flop regarding Libya defies the hopes of those who saw the nation as a dependable counterbalance. Russia's actions now serve to grant the globalist-praising, terrorist usurpers of Libya's rebellion an entire nation to despoil on behalf of Washington and London - perhaps even Moscow now, based on some behind-the-scenes deal. By participating in these illegitimate "international institutions" the nation-states we live under are granting the transnational elite legitimacy they would otherwise not have. It is impossible to discern whether the Russians or Chinese are participating in such farcical "international institutions" as part of a Machiavellian strategy, hidden complicity to an emerging global government, or for short-sighted, self-serving interests. What we can be sure of is our own commitment to our own interests and agenda on a local, county, and state/provincial level. Thus, we the people, be we Americans, Russians, or Chinese, must ourselves act as the counterbalance to the global-elite's unwarranted influence. Balking the Anglo-American corporate-financier oligarchs does not guarantee other oligarchs will not rise and take their place elsewhere. Only by committing to a new paradigm of local sovereignty, where state/provincial, and national power is beholden to self-sufficient people on a local level instead of multi-national corporations on a global level, do we end entirely the threat of any sort of global-elite lording over us. Sun Tzu in the "Art of War" once said, "therefore the clever combatant imposes his will on the enemy, but does not allow the enemy's will to be imposed on him." The ideal scenario for the globalists is for us to continue responding to their provocations on their terms. And whether we agree or disagree with their agenda, as long as we use their contrived institutions to contest them - we continue granting them more legitimacy regardless of the outcome of our protests. This is the ultimate strategy of tension, playing out daily on a global level, ensnaring well-intentioned but ignorant servants of the globalist agenda, as well as informed proponents of freedom and sovereignty alike. By turning our backs entirely on the global-elite's institutions, their ploys, their causes, their wars, and their false political dichotomies, and instead imposing our own will, on a local level, cutting off entirely the source of the global-elite's power (our complicity), we force them to react to the imposition of our own will. The Tenth Amendment movement is the very embodiment of this in modern day practice, with the "Food Sovereignty" movement and now Texas' battle against the TSA's usurpation of state and local law enforcement in their airports taking the front line. Regular Americans from across the country are leaving the corporate-pundit guided debates and taking action, guided not by some political agenda, but rather their own innate sovereignty. It starts with something as simple as planting your own garden, the piecemeal boycotting and replacement of all multi-national corporations, participation in our local government and the growing alternative media, and it results in the seizure of the unwarranted influence that has allowed a group of criminal international bankers to contrive their own international army, an international court, and the ability to wage war against entire nation-states with absolute impunity.